This was the last day of my Yangtze journey and the entrance to a wildly fascinating blend of East-West and what the 21st century has in store. You rise early - entry into Shanghai harbor is scheduled for 8 a.m. and you do not want to miss it. At about 6:30 a.m. we began threading our way down the Huangpa River, leaving the Yangtze to wend its way to the sea without us. River traffic was something else - as crowded as it was varied with mammoth barges filled with coal, motorcycles, even mature trees sharing narrow invisible lanes with cruise ships, tiny sampans and tugs. If Beijing is China's Washington, Shanghai is its New York City charging into the 21st century on speed. A perpetual motion machine pausing only when 12 lanes of traffic from two 2-lane streets funnels into a two-lane tunnel. You'll be awed, intimidated and invigorated. Building cranes may have become Beijing's state bird during the run-up to the Olympics but they were Shanghai's way before that. Leave for a day-long side trip and you'll return to find something new. The Bund, seen from Pudong. Most of us start with the old even though Shanghai, which means "above the sea," is a newcomer by Chinese standards. Despite people living here for at least eight millenia, Shanghai began to shine only after becoming an international trading port in the 1840s. West met East and liked it here. British, French and America staked commercial claims, the French to its cultural heart, the Brits to its banks, the Americans to its warehouses. There's still a small army of expats, including Wood Zapata, the company run by a Georgia architect and his Ecuadorian-born partner, preserving Xintiandi's Shukumen-style brick houses by turning them into restaurants, homes, nightclubs and bars. Good news: You'll like it because it's flat, especially when compared to where we've been! The Bund, a mile-long pedestrian promenade along the river - is a logical place for Westerners to start. Originally built as a dike against floods, it was faced by the city's international establishment. People flock here, from early morning exercise groups to late night party-hoppers. Tip: Stand with your back to the river to get a feel of the city's layout. Old Town is to the left and behind it the French concession. The British section begins with the promenade, followed by the Russian and American sections. Locate the Peace Hotel, once center of the city's social life. Across from it on the Bund is a pedestrian tunnel under the river to Pudong with its high-rising hotels and office buildings. Also a stand-up tram that goes through a kitschy but fun sound and light show. From the right side of the hotel and back is Nanjing Road, a pedestrian shopping street. If you tire, hop the motorized sight-seeing tram. When cars take over the road, immediately to the left is People's Park then Renmin (People's Square) and the Shanghai Museum. Beyond the museum is Xintiandi. Straight ahead is the Shanghai Centre with the Portman Ritz-Carlton Hotel. Hungry? Dine like a Shanghainese and stop at the food court, a covered, cavernous expanse of short-order cooks and diners. Make a choice, pay for it and the beverage of your choice, find a table and tuck in. No language barrier here. You'll find good shopping nearby. Thirsty? Take the Bridge of Nine Turnings, which keeps you safe from demons that travel only in straight lines, and stop for a cup of tea at the Huxingting Tea House. Warning: There are stairs, narrow ones, but it's doable. Just take your time. Frazzled? Spend the better part of an afternoon in YuYuan, Yu Pleasure Garden just beyond the tea house. Begun in 1577 and completed in 1709, its five acres are a maze of ponds, rockeries, 300-year-old wisteria, paths, bridges and Ming Dynasty pavilions. Each detail - and there are many - is worth noting: Doorways shaped as vases, leaves or moons; double corridors wider for men than for women; winding paths to vary the view, river rocks composed to resemble sea and mountains. You soon forget there's a city anywhere near. The Jade Buddha Temple looks older than it is (1918) because of its Song Dynasty (960-1279) architectural style of swirling eaves and incense darkened interiors. Decor is gaudy for Western tastes, the atmosphere is touristy but the White Jade Buddha upstairs is a gem. Twice life-size from a single piece of jade, the 455-pound Buddha is adorned with 24K gold and jewels, including a cap of all black pearls. The larger Sleeping Buddha is rough by comparison. Shopaholic? Go crazy in a silk shop. The fabric is fabulous, the tailoring is superb and your garments can be done in two days (including the initial and a second fitting) and delivered to your hotel for a pittance of what you'd pay in the States. Consider it investment dressing. Wish I'd bought more. The Shanghai Museum is arguably the best in China and well worth a hunk of your time. The fountain outside with its shooting water and surround sound from four mushroom-shaped speakers is fun to watch and, if it's hot, to play in. The kids won't mind. Tree-shaded streets make for good ambling as do its chic shops and good restaurants. At the Shanghai Arts and Crafts Research Institute, housed in a grand old French Renaissance-style mansion, you can watch some of the country's best artisans create needlework, intricate paper cutting and other amazing crafts. Admission is free but dare you not to buy something. The transition to the lower Yangtze is abrupt. Hills and mountains end at the dam's lock. Water runs slower, crops grow to the river's edges. If you've opted for the shorter cruise, this is where you disembark. Today's itinerary lists only the Hubei Provincial Museum. Too bad because the Yellow Crane Tower is quite pretty. Tip: If you get to Yellow Crane Tower, take the elevator to the top instead of climbing. Day 5 - Huangshan, Yellow Mountain. This is the China you've seen in films like Crouching Tiger Hidden Dragon. It will take three hours by bus to reach the mountain but don't miss it. En route you'll pass roadside stands of bonsai that echoes in miniature the mountain's wind-gnarled greenery, rice paddies, fish and pearl farms and structures with the picturesque upturned eaves and gables Westerners associate with China. After two hours the hills steepen, the roadside streams broaden and beehives, tea bushes and dark pines laced with new bamboo proliferate. The river becomes Tai Ping Lake, famous for its pearl culture, and yes, you will stop to shop. Eventually, you will reach the queue for the stand-up ride in the largest, longest cable car in China. It climbs steeply over plunging chasms and through dramatically thrusting thumbs and fingers of granite, lurching to a stop at each section. This is Chinese landscape painting personified. The 72 peaks have descriptive names - Lotus Peak, Heavenly Capital, Peak of Brightness. Pines and rocks are named as well - Greeting the Guests, Lying Dragon, Monkey Gazing at the Sea, Squirrel Leaping Up from the Peak, Rock Flown from Afar. Look quick because they appear and disappear through the thick waves of Huangshan's "Sea of Clouds". Tip: Paths, many with series of rock stairs, lace to and by various scenic outlooks. You can quickly tell if it is too much for you, but be prepared to see Chinese visitors, some looking as old as the mountain, stoically trudging along every one. Never mind. You know your limitations so take advantage of the many resting places and turn back if it gets too strenuous. Huangshan is rugged, remarkable, mystical and unforgettable. Not surprisingly, the area at its flanks is known for its production of fine papers, paintbrushes, ink sticks and stones. On the ride back to the ship you may find yourself sketching what you've seen or composing bad Chinese poetry about it. In case of bad weather or road conditions, the company now substitutes Jiuhuanshan, Mountain of the Nine Lotuses, which sounds intriguing, too. Day 6 - Nanjing, the Southern Capital. Once the capital city for eight dynasties between the third and 14th centuries, Nanjing is now an industrial, mid-sized city of 6 million. The first walled, Forbidden City was here and you can still see remnants of the wall. You will be shown the Ming Tombs - we missed them because a committee from UNESCO was considering it for International Heritage site status - and the Dr. Sun Yat-sen Mausoleum. Tip: There are 392 steps up to the mausoleum. Don't bother. Visit, instead, the lovely park that surrounds it. The shops are good and the people watching is great. You'll like Fu Zi Miao, the Qing Dynasty-style bazaar clustered about a rebuilt Confucius Temple from the Song Dynasty. Prices are good and can get better if you haggle a bit and it's fun to watch the Nanjing teens clustering around McDonald's and the younger kids drawn to the bird, reptile and pet market. Try not to think about that puppy maybe becoming a delicacy instead of a pampered member of the family. And do consider the caveat our guide shared, "Buy cheap shirt, wash once, give to your children." Well, the Yangtze used to be a dragon and was when I cruised down it, but post Three Gorges Dam, it's probably more like a gentle eel than a capricious dragon. The itinerary has changed since I made the trip but I doubt that it is any less memorable. Passenger boats on the Yangtze. Technically, only the stretch from Shanghai to Yangzhou of the world's third-longest river is the Yangtze. To the Chinese it was the Changjiang - long river - but the first British visitors' mistake has been a lasting one. Most travelers want to see the Three Gorges area and take a three- to four-day cruise. I wanted to go from Chongjiang, western cruise terminus, to Shanghai, the eastern terminus, and am glad I did, even though it meant missing Xian and the Terra Cotta Warriors and a side trip to Ya-an to see the pandas (next time!). I also chose Victoria Cruises, another fortuitous choice. Tip: The largest of Victoria's fleet - the Victoria Anna, Jenna and Katarina - have elevators. The smaller ships do not. If money is no object, the Shangri-La suites at the bow guarantee great views and for those early morning scenic wonders, because you can see both sides of the river, you won't have to get dressed and come on deck. Not that it will take you much time to dress - attire is very casual with something nice needed only for the captain's receptions. Passengers were a United Nations mixture - American, British, Australian, Indian, Chinese, German and Taiwanese. Chongjiang. Pronounced Chong-ching, this city of 33 million is like San Francisco on steroids. It's hilly, so hilly that instead of the plethora of bikes you see elsewhere, here they are motorized. Scooters are popular too and it's a genuine bit of culture shock to see frail-looking little men bent under wooden shoulder yokes and balancing woven baskets heaped high with forage driving bright yellow scooters. I can't tell you much about Chongjiang because my plane from Beijing was so late it was after dark when I arrived and was taken directly to the ship. However, a frequent travel companion tells me she thoroughly enjoyed her day spent in what was headquarters for Chiang Kai-shek and the Flying Tigers of World War II. It is known as the country's foggiest city in the winter and one of China's three furnaces in summer. That I can attest to. Warning: It was a precipitous, winding walk from where the car parked to the dock for me. Since the completion of the Three Gorges Dam, however, where we parked should be underwater so you might have a nice, relatively level entry. I emphasize the might. This will apply to all ports west of the dam although I suspect with the new building, access points should have improved. If you need more up-to-date details, e-mail me and I'll find them out from fellow travel writers. Hold hands crossing this bridge if you want to remain lovers in the afterlife. Fendu is a colorful as it is inscrutable. Day 1 - Fengdu, the Ghost City. The ship left on time, slipping easily into the busy stream of river traffic - rowboats, huge barges, even Russian-made hydrofoils. The city is one of those that was inundated by the dam, but its primary attraction, a kind of Disneyland of the Dead, survives. It recreates the series of lurid stops and trials Buddhists must negotiate en route to heaven. You will probably chalk it up as inscrutable; I did, but on a clear day the views from Mount Minshan compensate nicely. You may miss it altogether: current itineraries list a relocation village as an alternative. Lesser gorges via Daning River. Day 2 - Wushan and ship locks. You'll pass through the Qutang Gorge first thing in the morning then disembark at Wushan for an excursion to the Daning River Small Gorges or Shennong Stream. Motorized sampans take you up the Daning through ever-changing scenery - hillsides to cliffs where monkeys clamber and clamor. Where once we stopped at Zigui for the night, today's cruise sails through the Gorges Dam ship locks. Day 3 - The Dam. Today you will tour the culmination of a dream that began in 1919 with Dr. Sun Yat Sen, China's George Washington. Like everything in China, it's big beyond imagining. The water west of the dam should be at its highest so you can see if silt buildup is the problem many feared. You'll reboard the ship at Yichang. Tour itineraries - and as a first-timer you'll be glad you're on one - rarely devote more than two days to China's capital which can be a shame or a good thing, especially for Levelers. My introduction to Beijing was like looking through a thick brown scrim; the city and color will be etched together forever in my mind. Someone said a dust storm from the Gobi had filled the air with brown particulates. As if your jet-lagged vision weren't bleary enough, air pollution coats everything. Tip: After the 24 hours it takes most of us to get there, the next two days will be something of a fog. If you can handle the air quality or lack thereof, I advise at least a three-day stay. Give yourself a day to further explore your favorite sites when your brain is clearer and more receptive. Or, return to Beijing at the end of your trip and spend a few days before flying home. If you luck into one of those rare, clear and sunny days, push yourself to the limit and see as much as you can. Rest when the air is muddy. The layout. Beijing is a big city surrounded by four ring roads crammed with cars, trucks, scooters and bicycles circling monuments from the past and today's government buildings; think Washington, D.C. with many more residents and tourists. The first ring road surrounds the heart of government past and present - the Forbidden City, Tiananmen Square. The second encloses the hotel and retail center and the third the prime office and apartment core. The "quaint" of your imagination, assuming any is left, is hidden down obscure alleys or preserved and presented as tourist attractions. Tip: Realize at the outset that you'll barely reach the surface much less scratch it here (or anywhere in China for that matter). If you are on a tour, it will of necessity be regimented and you may spend more time in Friendship stores and cloisonne factories than at major sites. If you can afford a private guide and driver you still will go to those (I think they have to take you), but you'll be able to leave sooner and stay longer at what you want to see. What to see. Let's start with most everyone's two list toppers. The Great Wall. Badaling, where most of us including the Chinese visit, is a half-day trip and while we know the wall is big - 20-30-feet high, 25 feet wide at the base. 16 feet at the top and 3,930 miles long - how much you see and your overall impression depends on weather conditions when you visit. Crowds, clouds and fog can limit your vision to what is under your feet. After climbing the stairs and ramps to reach the top, I hobbled through two guard posts/watch towers hoping the fog would clear (I was on a cane then, pre-knee replacement). When I asked Li-li, my guide, what I'd see if I walked farther, she said to turn around. In other words, the same. Tip: Don't knock yourself out here. If you want more "private" wall moments, there are other, less trafficked portions near Beijing, but I wouldn't recommend them for Levelers. This is the most touristy because it's the easiest to negotiate and most completely restored. Your guide probably will have you eat at the restaurant here and visit the large store adjacent to it. The food was fair and the souvenir prices were high. There are great photo-ops besides the ancient structure and the fascinating groups, couples and families wall-walking with you. As hokey as it is, wish I'd taken/had the time to don the costume of a Mandarin emperor, princess or concubine and have my picture taken astride the Bactrian (two-hump) camel or the Tang-like white stallion - preferably both! The Forbidden City. This will be the most challenging must-see for Levelers. There is no way around it, you have to walk to see it. Fortunately, it's flat. There are stairs but they come at intervals and there are places to sit or prop. This is a monumental exercise in dynastic aggrandizement and is almost as impressive now as it was meant to be. Not as daunting, though, because most of us Westerners are unaware of the stringent protocol that was rigidly and brutally enforced. All you see was designed to emphasize the emperor's importance and godliness, to enhance his success in bringing peace and harmony to the nation and to ensure his safety. Gates, more like buildings than mere openings, have several entrances, the smallest for mortals, the largest for the emperor. Likewise, three bridges cross a moat - one for the emperor, another for his family, the third for those who served them. Every stud, sculpture and color has meaning. Walls and columns are red, the lucky color, Roof tiles are yellow, a color representing gold, food, water, earth and fire reserved for the emperor. Floor tiles add up to lucky numbers, protective statues glare out from the eaves. Nothing was left to chance in the 8,700 halls and buildings. Most are off limits to visitors. The emperor's garden, a small gem of vistas, paths and viewing pavilions, is the only comfortable space and the only place in the Forbidden City where you will find trees or greenery. 1. Nothing should be higher than the emperor. 2. Trees in courtyards were not considered auspicious. 3. Trees could hide spies or snipers. Tip: Schedule your visit - several hours if you can - so that by the time you have gone from one end of the Forbidden City to the other, it is time for lunch and a bit of sitting. When you are rested, return to take in Tiananmen Square. There is so much I missed inside the halls because my knees were killing me, but I wouldn't take anything for what I did see and I know where I'll head if and when I return. The Summer Palace. Or, more accurately, the Idyllic Garden of Ease and Harmony, has all the pleasure in its 700 acres that the Forbidden City lacks. Emperors and their entourages found relief from the city's heat, hubbub and formality in this compound of lakes and palaces during the 19th century and Beijingers and tourists do today. On any given day thousands stroll along the lake front, sit under under the ornamented covered arcade known as the Long Hall admire the pocket gardens and river rocks, wander palace structures and sail across the lake in dragon boats, large barge-like incarnations or small, bright plastic pedal versions. In short, it's a delightful way to spend an afternoon although you could take months getting to know its nooks, crannies and vistas. Tip: Yes, you'll walk, but it, too, is relatively flat, there are ample places to rest in the shade, vendors of food, drink and souvenirs at each of the four gates and fascinating people watching. Tian Park and Temple of Heaven. In Dynastic days, this is where the emperor communicated via sacrifice with Shangdi, the Pearly Emperor Supreme of the Sky. I've read glowing reports of the temple's architectural grandeur and the park surrounding it is idyllic and as unstructured as any open space I saw in Beijing. Unfortunately, I was taken there straight from the airport - the plane had been delayed by several hours - for dinner. Those dust particulates darkened the twilight and jet lag blurred the vistas. I remember brown, a large fancy dining room that had seen better days and good food once I got over the oddness of being the only person not only at the table but in the room (everyone else was at tables outside). There I was, seated at a huge round table upon which a banquet's worth of food was brought and placed on the lazy susan by staff that stood by silently watching my every bite. Bizarre. "Flower fish, chicken with peanuts, braised lettuce, dumplings" is what I find in my notebook - not much help. I do remember lots of steps leading up to the temple and suspect the park would be a great place to go to meet Beijingers. Eating. Hotels frequented by tourists offer Chinese- and Western-style breakfast fare. Your guide will have preselected stops for lunch and dinner although if you are traveling without a group, you probably can arrange changes if you have a particular restaurant in mind. No trip to Beijing - Peking in former times - however, would be complete without a Peking Duck Dinner. I know there are less touristy places but Beijing has its more egalitarian version of Tour d'Argent, Paris's duck joint, and I'm glad I was taken to Quanjude. Don't be deterred by the very large, very yellow plastic ducky by the entrance; it's a nice place. I was seated in a cavernous but grand dining room on fifth floor - there's an elevator - just beyond the duck ovens. Tip: Duck banquets can have so many courses the quack gets cooked twice but I'd recommend the basic dinner. Don't fill up on the pre courses - duck soup and beef with onions - because the whole, crispy skinned duck is ahead. Here, as in every other restaurant I was taken to, a plate of fruit, usually melon, signals the end of the courses. China is a stretch if you have any trouble walking or climbing stairs but it's worth the effort, especially for Westerners who will find themselves flabbergasted by its size, culture and potential. My foray into its vastness began in Beijing, shifted to Chongqing, jumping off port for a cruise on the Yangtze that ended in Shanghai. In the posts to come I'll share info and tips on all stops but for now, let's start with some generalities. Flying time from New York is 13 hours or so. If you're tall, move heaven and earth to get a bulkhead aisle seat or splurge on business class. You'll need it. In either case, get up and move around and do seated exercises to keep your circulation up. Airports in Beijing and Shanghai are crowded but have wonderful fruit. Tip: There's an extra step we aren't accustomed to. After checking in with your carrier and getting a boarding pass, look for a line of cashier-like windows with mobs of people milling about. Pick a window, get out your yuan and shove your way through; politeness does not count. Pay the cashier - it was 50 yuan (about $6) in Beijing, 90 yuan ($10) in Shanghai when I was there - and hang on to the piece of paper handed to you; it shows you have paid your airport tax. You won't get past security without it. When to go. I went in August, which was fine except that rains tended to flood low-lying areas. Beijing weather is similar to that in Philadelphia, Shanghai's is like northeast Florida. Tip: If this is your first trip to China, do not go during any time span that includes May 1, Oct. 1 or Chinese New Year's Day. Transportation, hotels and restaurants will be crammed with Chinese travelers using holidays to extend vacations (just like we do). Thus, everything will be understaffed. Numbers. We all know about the crowds, but to the Chinese, numbers have special meanings. 1 connotes want, 2 = song, 3 = grand song, 4 is unlucky, 5 = Myself, I, 6 = luck, 7 = eating, 8 = money, rich (a favorite), 9 = forever and 0 = nothing. They are combined for specific messages. For example, 5168 means I want luck and money. What to bring. VERY comfortable, sturdy shoes. If you think Europe and the Americas are unevenly paved, consider how long the Chinese civilization has been piling up rocks and stones and nature via earthquakes and erosion has been tearing them down. The Chinese must have the world's strongest ankles. If yours are weak, toss in an Ace bandage or two. Walking sticks or collapsible cane. Casual clothes, with one nicer ensemble for dinner in Shanghai. If you are sticking to cities and a Yangtze cruise, laundry services are available so keep that suitcase empty enough to hold lots of souvenirs. You won't and shouldn't resist them, especially the silks and amazingly fast and cheap tailoring. Tip: Speaking of that, Beijing is known for its cloisonne, Suzhou for its wonderful silk - I love my silk comforter and duvet cover! - and Shanghai has wonderful tailors. The best jade is old, translucent, dense and cuts glass; test before you buy. The best silk feels cool to the touch and slightly sticky. Often what is touted as 14K gold is actually gold plated. Real gold will have a government stamp and the color goes all the way through. Starting to scratch or bite a piece of jewelry is often enough to make the merchant more truthful. Do haggle. I never found anywhere, from street vendor to the cavernous Friendship stores where a better price wasn't available. The people. They love to pose for photographs and have a great sense of humor. Get them laughing and you've made a friend. No, the Chinese aren't always angry; they just like to talk loud. They can be blunt, too, asking visitors everything from "How much?" to "How old?" Answering gives you the right to ask questions of them. Doorways. The sills are high to prevent good spirits from leaving a room and bad spirits from entering. Bugs and crawly things are deterred, too, as are flood waters. The highest door sills you'll encounter are at temples because as one guide said, demons have been told that if they catch a monk and eat him, they will become immortal. Double doors at hotels usually are offset instead of aligned - better feng shui. The less you pack, the lighter the bag, the easier the trip. We all know that but how is the problem. I just road tested FRESHhanger, a start toward the solution. You know how the third time you go to wear a blouse it looks okay but just doesn't feel fresh? If you'd left it in the closet overnight atop a FRESHhanger, it will seem as fresh as when you first packed it. These are covers, infused with activated carbon technology, that take up almost no space at all and slip over any style of clothes hanger. Put your oft-worn blouse, shirt or jacket over it and in four hours, voila! staleness gone. A daytime shirt that is usually good for 2, at most 3, wearings, I wore five times on a recent trip to Mexico. An evening top exposed to cigarette smoke was ready to go again the next night. 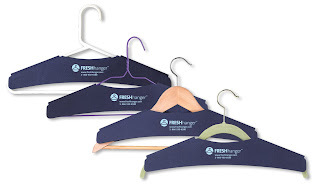 FRESHhangers come five to a package for $14.95 and you can find all about buying them at www.freshhanger.com or by calling 866-530-6580.